CHICAGO, Dec. 20, 2018 /PRNewswire/ --�Today Conagra Brands, Inc. (NYSE: CAG) reported results for the second quarter of fiscal year 2019, which ended on November 25, 2018. The Company completed the acquisition of Pinnacle Foods Inc. (Pinnacle) on October 26, 2018; these second quarter results include the impact of 31 days of Pinnacle ownership. All comparisons for Legacy Conagra results are against the prior-year fiscal period, unless otherwise noted. Certain terms used in this release, including "organic net sales," "retail sales," "Legacy Conagra," and certain "adjusted" results, are defined on page 6 of this release under the section entitled "Definitions." As noted above, the Company completed the acquisition of Pinnacle on October 26, 2018. In the quarter, net sales grew 9.7%, driven primarily by the Pinnacle acquisition. Organic net sales excluding the sale of the Trenton, Missouri production facility (Trenton), decreased 1.6%. The Company estimates that 220 basis points of the decline in organic net sales growth is attributable to the impact of hurricanes in the prior-year period. The Refrigerated & Frozen segment continued its momentum in the second quarter, with net sales growth of 1.7% and organic net sales growth of 0.5%. The Legacy Conagra frozen business continued to deliver solid growth behind innovation-driven gains in distribution. Second quarter adjusted operating margin for Legacy Conagra was above the previously-provided second quarter guidance range and adjusted operating profit showed strong double-digit growth. Diluted earnings per share (EPS) from continuing operations decreased from $0.54 to $0.32 in the quarter, and adjusted diluted EPS from continuing operations grew 21.8% from $0.55 to $0.67. On a Legacy Conagra basis, adjusted diluted EPS for the quarter was above the Company's previously-provided second quarter guidance range. Informed by eight weeks of Pinnacle ownership, the Company expects to exceed the $215 million Pinnacle-related cost synergy target. The Company will host an Investor Day on April 10, 2019 in Chicago, Illinois where it will share more information on the Pinnacle synergy opportunities and the Company's long-term algorithm. He continued, "In the short time since completing the Pinnacle acquisition, our team has been working hard on a seamless integration and an intense diagnostic to clarify both the challenges and opportunities within the Pinnacle portfolio. While we have identified challenges, they are clearly executional, not structural, in nature. 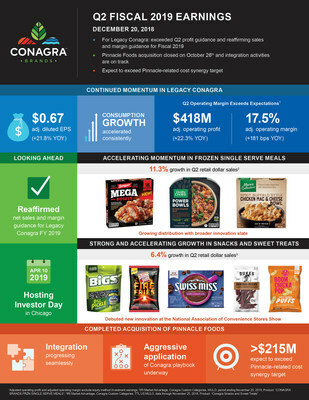 We are aggressively applying Conagra's proven brand-building and innovation playbook to restore share growth.�While this work will take time, we have done this before and remain confident in our ability to enhance Pinnacle's portfolio of leading brands and drive long-term shareholder value.�Additionally, we expect to over-deliver on our cost synergy target. While we are starting from a lower base in fiscal 2019, we expect to deliver strong EPS growth off that base and hit the fiscal 2022 EPS target that drove our original EPS accretion guidance for this transaction, and we remain committed to our previously-communicated leverage target. We look forward to providing a more comprehensive update at our Investor Day." In the quarter, gross profit increased 2.9% to $677 million.�Adjusted gross profit increased 7.6% to $704 million or 29.5% of net sales.�The addition of Pinnacle's gross profit, together with supply chain realized productivity and improved pricing in the Legacy Conagra business, more than offset higher transportation and input costs and the previously-mentioned increases in retailer marketing for the Legacy Conagra business. 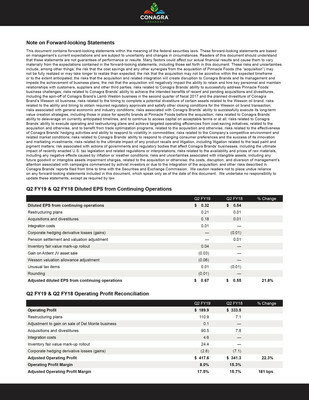 In the quarter, selling, general, and administrative (SG&A) expenses increased 50.1% to $487 million, primarily due to the expenses related to the Pinnacle acquisition and associated restructuring plans.�Adjusted SG&A expenses decreased 4.4% to $217 million, primarily as a result of lower incentive compensation expense in the Legacy Conagra business, including lower stock-based compensation expense due to a lower stock price compared to the prior-year period, partially offset by the addition of expenses related to the Pinnacle business. Advertising and promotional (A&P) expense decreased 19.4% to $69 million in the quarter as the Company continued to shift investments in the Legacy Conagra business from A&P investments to retailer marketing. Net interest expense increased $43 million to $81 million in the quarter.�Adjusted interest expense increased $36 million to $74 million, primarily driven by higher levels of debt outstanding compared to the prior-year period.�The increased level of debt outstanding was driven by the net debt incurred in connection with the Pinnacle acquisition. The average diluted share count increased 11 million shares in the quarter to 422�million shares. The increase was primarily driven by the shares issued in connection with the Pinnacle acquisition, partially offset by share repurchases executed during fiscal 2018. Net sales for the Grocery & Snacks segment were relatively flat at $900 million in the quarter, and organic net sales declined 1.9%.�The acquisition of Angie's BOOMCHICKAPOP added 180 basis points to the net sales growth rate, with the approximate 190 basis point impact of the hurricanes in the prior-year period more than offsetting this benefit.�Volume declined 2.2%. The segment's net sales were negatively impacted by the previously-mentioned hurricane effects and declines in certain non-core grocery brands, as well as a reduction in certain shipments late in the second quarter, which shifted to the third quarter.�However, the trends in the snacks & sweet treats business in the quarter were strong, with 6.4% retail sales growth. In addition, price/mix increased 0.3% as favorable pricing more than offset increased investments in retailer marketing. Operating profit for the segment increased 4.6% to $209 million in the quarter and adjusted operating profit was approximately flat at $211 million. The segment delivered supply chain realized productivity and lower SG&A expenses to more than offset higher transportation and input costs. Net sales for the Refrigerated & Frozen segment increased 1.7% to $771 million in the quarter, and organic net sales grew 0.5%.�The acquisition of Sandwich Bros. of Wisconsin added 120 basis points to the net sales growth rate.�Volume grew 0.5% behind frozen innovation from brands across the portfolio, including Banquet, Healthy Choice, Marie Callender's, P.F. Chang's, and Frontera.�The benefits of this innovation more than offset declines in net sales for specific refrigerated businesses. Frozen single serve meals continued to show positive trends, growing 11.3% in retail sales in the quarter.�Price/mix was flat to the prior-year year period as the Company secured favorable pricing and mix but chose to support new innovation with increased retailer marketing. Operating profit increased 7.6% in the quarter and adjusted operating profit increased 7.7% to $138 million.�Increased net sales, coupled with solid supply chain realized productivity, and lower SG&A expenses more than offset higher transportation and input costs. Net sales for the International segment decreased 5.4% to $208 million in the quarter, and organic net sales increased 3.9%. The sale of the Canadian Del Monte business reduced the net sales growth rate by 600 basis points and the acquisition of Angie's BOOMCHICKAPOP increased the growth rate by 80 basis points.�The impact of foreign exchange unfavorably impacted the net sales growth rate by 410 basis points. Volume grew 0.6%, led by strong growth in the snacking portfolio, specifically popcorn. Price/mix increased by 3.3% with the segment delivering favorable pricing and mix. Operating profit increased 22.8% to $25 million in the quarter while adjusted operating profit increased 18.1%.�The Company's ability to secure favorable pricing and mix, as well as supply chain realized productivity, offset higher input costs. Net sales for the Foodservice segment decreased 16.5% to $246 million in the quarter, and organic net sales excluding Trenton decreased 10.4%. The sale of the Trenton facility lowered the net sales growth rate by 6.1 percentage points and the Company estimates that the effect of the prior-year hurricanes reduced the organic net sales growth by approximately 10.2 percentage points.�Volume declined 12.9% in the quarter, primarily driven by the previously-mentioned hurricane impact. Price/mix increased 2.5% as inflation-driven price increases more than offset unfavorable mix. Operating profit decreased 31.2% in the quarter as the impacts of lower volume, unfavorable customer mix, and higher input costs more than offset supply chain realized productivity and lower SG&A expenses. Operating profit for the Pinnacle segment totaled $29 million for the 31 days of the Company's ownership, and adjusted operating profit was $57 million.�This performance was below expectations as the impacts of higher transportation costs and lower net sales were only partially offset by lower SG&A and A&P expenses in the business. Corporate expenses increased $181 million to $243 million in the quarter.�Adjusted corporate expenses decreased 30.9% to $46 million, $47 million of which is related to Legacy Conagra; a $1 million gain is related to Pinnacle.�The decrease is mainly due to lower incentive compensation expense, including lower stock-based compensation expense due to a lower stock price compared to the prior-year period. Pension and postretirement non-service income decreased 44.4%, or $8 million, to $10 million in the quarter, reflecting the previously-disclosed asset mix shift in the Company's pension plans and the lapping of higher plan fees in the prior-year period. Equity method investment earnings increased 83.4% to $38 million primarily due to a gain on the sale of an asset by the Ardent Mills joint venture.�Adjusted equity method investment earnings increased 9.8% as the Ardent Mills joint venture continued to improve operational efficiencies and benefited from improved market conditions. As previously noted, the Company completed its acquisition of Pinnacle on October 26, 2018. As previously announced on December 18, 2018, the Company entered into a definitive agreement to divest the Wesson oil business.�The Company expects to complete the transaction by the end of the first calendar quarter of 2019, subject to the satisfaction of customary closing conditions, including receipt of regulatory approval. All guidance metrics shown below include the expected results for the Wesson oil business for the full time period indicated. Organic net sales growth excludes from reported net sales the impacts of foreign exchange, divested businesses and acquisitions, including the Pinnacle acquisition (until the anniversary date of the acquisitions).�All references to changes in volume and price/mix throughout this release are on an organic net sales basis. References to adjusted items throughout this release refer to measures computed in accordance with GAAP less the impact of items impacting comparability. Items impacting comparability are income or expenses (and related tax impacts) that management believes have had, or are likely to have, a significant impact on the earnings of the applicable business segment or on the total corporation for the period in which the item is recognized, and not indicative of the Company's core operating results.�These items thus affect the comparability of underlying results from period to period. References to retail sales are based on Conagra's IRI custom category definitions for the 13-week period ended November 25, 2018. Conagra Brands will host a webcast and conference call at 9:30 a.m. Eastern time today to discuss the results.�The live audio webcast and presentation slides will be available on www.conagrabrands.com/investor-relations under Events & Presentations. The conference call may be accessed by dialing 1-877-883-0383 for participants in the continental U.S. and 1-412-902-6506 for all other participants and using passcode 1874533. Please dial in 10 to 15 minutes prior to the call start time. Following the Company's remarks, the conference call will include a question-and-answer session with the investment community. A replay of the webcast will be available on www.conagrabrands.com/investor-relations under Events & Presentations until December 20, 2019. Conagra Brands, Inc. (NYSE: CAG), headquartered in Chicago, is one of North America's leading branded food companies. Guided by an entrepreneurial spirit, Conagra Brands combines a rich heritage of making great food with a sharpened focus on innovation. The company's portfolio is evolving to satisfy people's changing food preferences. Conagra's iconic brands, such as Birds Eye�, Marie Callender's�, Banquet�, Healthy Choice�, Slim Jim�, Reddi-wip�, and Vlasic�, as well as emerging brands, including Angie's� BOOMCHICKAPOP�, Duke's�, Earth Balance�, Gardein�, and Frontera�, offer choices for every occasion. For more information, visit www.conagrabrands.com . This document contains forward-looking statements within the meaning of the federal securities laws. These forward-looking statements are based on management's current expectations and are subject to uncertainty and changes in circumstances. Readers of this document should understand that these statements are not guarantees of performance or results. Many factors could affect our actual financial results and cause them to vary materially from the expectations contained in the forward-looking statements, including those set forth in this document. These risks and uncertainties include, among other things: the risk that the cost savings and any other synergies from the acquisition of Pinnacle Foods (the "acquisition") may not be fully realized or may take longer to realize than expected; the risk that the acquisition may not be accretive within the expected timeframe or to the extent anticipated; the risks that the acquisition and related integration will create disruption to Conagra Brands and its management and impede the achievement of business plans; the risk that the acquisition will negatively impact the ability to retain and hire key personnel and maintain relationships with customers, suppliers and other third parties; risks related to Conagra Brands' ability to successfully address Pinnacle Foods' business challenges; risks related to Conagra Brands' ability to achieve the intended benefits of recent and pending acquisitions and divestitures, including the spin-off of Conagra Brand's Lamb Weston business in the second quarter of fiscal 2017 and the planned divestiture of Conagra Brand's Wesson oil business; risks related to the timing to complete a potential divestiture of certain assets related to the Wesson oil brand; risks related to the ability and timing to obtain required regulatory approvals and satisfy other closing conditions for the Wesson oil brand transaction; risks associated with general economic and industry conditions; risks associated with Conagra Brands' ability to successfully execute its long-term value creation strategies, including those in place for specific brands at Pinnacle Foods before the acquisition; risks related to Conagra Brands' ability to deleverage on currently anticipated timelines, and to continue to access capital on acceptable terms or at all; risks related to Conagra Brands' ability to execute operating and restructuring plans and achieve targeted operating efficiencies from cost-saving initiatives, related to the acquisition and otherwise, and to benefit from trade optimization programs, related to the acquisition and otherwise; risks related to the effectiveness of Conagra Brands' hedging activities and ability to respond to volatility in commodities; risks related to the Company's competitive environment and related market conditions; risks related to Conagra Brands' ability to respond to changing consumer preferences and the success of its innovation and marketing investments; risks related to the ultimate impact of any product recalls and litigation, including litigation related to the lead paint and pigment matters; risk associated with actions of governments and regulatory bodies that affect Conagra Brands' businesses, including the ultimate impact of recently enacted U.S. tax legislation and related regulations or interpretations; risks related to the availability and prices of raw materials, including any negative effects caused by inflation or weather conditions; risks and uncertainties associated with intangible assets, including any future goodwill or intangible assets impairment charges, related to the acquisition or otherwise; the costs, disruption, and diversion of management's attention associated with campaigns commenced by activist investors or due to the integration of the acquisition; and other risks described in Conagra Brands' reports filed from time to time with the Securities and Exchange Commission.�We caution readers not to place undue reliance on any forward-looking statements included in this document, which speak only as of the date of this document.�We undertake no responsibility to update these statements, except as required by law. This document includes certain non-GAAP financial measures, including adjusted diluted EPS from continuing operations, organic net sales, adjusted gross profit, adjusted operating profit, adjusted gross margin, adjusted SG&A expenses, adjusted corporate expenses, adjusted equity method investment earnings, adjusted operating margin, adjusted effective tax rate and adjusted net interest expense. Management considers GAAP financial measures as well as such non-GAAP financial information in its evaluation of the Company's financial statements and believes these non-GAAP measures provide useful supplemental information to assess the Company's operating performance and financial position. These measures should be viewed in addition to, and not in lieu of, the Company's diluted earnings per share, operating performance and financial measures as calculated in accordance with GAAP. Certain of these non-GAAP measures, such as organic net sales, adjusted gross margin, adjusted operating margin, adjusted effective tax rate, adjusted net interest expense, and adjusted diluted EPS from continuing operations, are forward-looking. Historically, the Company has excluded the impact of certain items impacting comparability, such as, but not limited to, restructuring expenses, the impact of the extinguishment of debt, the impact of foreign exchange, the impact of acquisitions and divestitures, hedging gains and losses, impairment charges, the impact of legacy legal contingencies, and the impact of unusual tax items, from the non-GAAP financial measures it presents.�Reconciliations of these forward-looking non-GAAP financial measures to the most directly comparable GAAP financial measures are not provided because the Company is unable to provide such reconciliations without unreasonable effort, due to the uncertainty and inherent difficulty of predicting the occurrence and the financial impact of such items impacting comparability and the periods in which such items may be recognized.�For the same reasons, the Company is unable to address the probable significance of the unavailable information, which could be material to future results.